How Do I Know What Binder Ring Size I Need? Need to buy some view binders for a big special project, but uncertain what binder ring sizes you need? One of the most frequent questions we get from customers shopping for office supplies is “What size ring binder do I need?”. People often have a binder that is the right size they’d like to buy, but have no idea what ring size that binder is so they can order more, causing them to pull out the ruler and estimate the size. The first thing to remember – you DO NOT determine binder rings sizes by measuring the spine, (and unfortunately many people use this method and order the wrong size). Binder sizes are actually based on the size of the ring not the spine, and with today’s many different ring styles that are not a perfect circle, like D-rings, EZD, and Slant-D ring binders, measuring the ring is virtually impossible. What side of the ring do you measure? To find the right binder ring size for your needs, do not measure the spine. The only sure fire way to always order the right size binder for your needs is by basing it on the number of sheets you plan to put into the binder. While it is true you can measure the diameter of a round ring binder to get the correct binder size, various D-ring styles are very popular today, so do not try and measure when a D-ring binder is what you need. Typically people order a much larger binder than they really need. For example, you may have a bunch of sheets to go into a view binder and think a 3 inch ring is what you need, but do you really have 500+ sheets? That’s a full ream of copy paper which is a lot of paper. 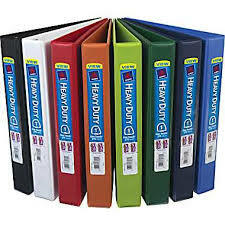 Even when you have lots of materials to insert, a 1-1/2 inch or 2 inch binder is usually large enough for most uses. Of course sometimes you may need a huge binder for storage or massive projects. That’s where 4 inch and 5 inch binders come in. They are perfect for storing large amounts of paper and are very durable. When it comes to binder brands, ZumaOffice.com recommends Universal view binders as the best value to quality brand. That means Universal binders give you good quality and a great price. If durability and heavy-duty binders are important to you, then we recommend the Avery Durable line of binders which are more expensive, but last longer than typical binders. And for heavy duty projects, we like to go with Wilson Jones Heavy Duty binders for their durable construction, heavier rings, and thicker board. Of course whenever there is a doubt, it’s always best to call and ask your office products dealer what size they recommend. Better to be safe than have cartons of products that are the wrong size that need to be returned. Shipping binders is not cheap! Whatever binder you need, be it view binders, non-view binders are specialty items like index dividers and table of contents dividers, always make certain you are purchasing exactly what you need. Buying office supplies online is convenient, fast and can save you money, but it is always wise to make certain what you are buying, especially when it comes to binders, is exactly what you need! This entry was posted in Office Supplies and tagged binder ring sizes, binder sizes, office supplies, ring size for binders, view binders. Bookmark the permalink.